HJ: Healing is the path to reconnecting with your wholeness. To once again embodying who you truly are. To removing everything which is not you, but simply faulty perceptions of yourself, others, the world and reality as a whole that keep you locked into struggle and suffering. This is the path to the happiness, peace, confidence, self-love and abundance that you crave. You will be greatly rewarded for your work here… so be bold and go deep and know that you are truly invincible. I had forgotten the concept of this game that we played as kids until much later in life, when I developed stress, anxiety, and depression due to Complex Post Traumatic Stress Disorder (C-PTSD). My C-PTSD resulted from a youth of constant bullying—which is now seen as a form of child abuse—and this song came back to me in my lessons to recover. By the time my anxiety and depression took full hold of me, I had spent five years trying to help others suffering with the long-term effects of bullying, but I had not yet confronted my own demons. It was much like the concept of “physician, heal thyself”—I was helping others without helping myself first. I found myself in a constant state of anxiety, and then depression set in. I could no longer sleep, focus, or even find a moment of enjoyment in life. For me, it might have been over. But I made an important decision that so many don’t make: While I felt completely alone and lost, thinking I was crazy, I contacted trusted mentors. They led me to mental health specialists who knew how to put me on the path to recovery. It was not quick, as it would take two years to feel “back to normal,” or at least was the new normal for me. In my sessions with mental health specialists and in the many books I read about the issues I was having, there was one common theme: In order to get better, you have to face and go through your problems, not avoid them, as many people who have suffered from child abuse do. We all believe that we can bury or forget these things that happened to us as children, but in truth they are always with us. 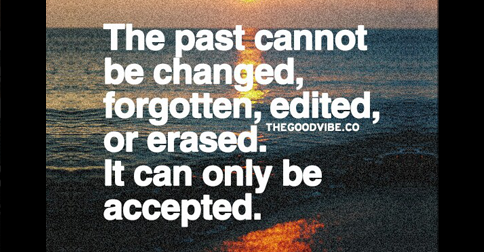 We must find a way to accept that which we cannot change and move forward without the past haunting us forever. I found that to begin the healing process, you have to first let go of the pain of the past. You cannot heal without this crucial first step. Here’s what helped me “go through it” so I could let go and heal. Remember and face what you’d prefer to avoid. You can’t go over your problem, you can’t go around your problem; you will need to go through it. This means that you will have to face and in many cases relive the issues that you have suppressed for so long. For me, it was having to deal with the low self-esteem I had developed from my C-PTSD and relive all of these events again. Yes, it was painful, but far less painful than a lifetime of burying my feelings would be. I went the professional route, and I found “talk therapy” to be the most helpful part of my healing process. At first it hurt terribly to dredge up these stories, and I would cry as I relived the hurt. But after a while of telling it, it became just a story. You might also find it helpful to see a psychologist or therapist, or it might be sufficient to lean on a friend or relevant. The important thing is that you share all the details you’ve buried inside so you’re no longer hiding them in shame. Focus on the good in the bad. I learned that, while people can be cruel, others can be loving and supportive—like my family and true friends. As I’ve opened up to them, they’ve shown me sympathy and empathy. I wouldn’t have chosen to be bullied, but I appreciate that the difficult times in life allow us to see how much others care. It is easy to forget the good parts of your life when you are going through a difficult time. Remember that there is both good and bad in your story, and you too may feel differently about the pain you’ve endured. Find a lesson in your pain. It helped me to find a lesson in this painful period in my life—something that I could use to help myself and others going forward. I learned that many people hurt others when they’re hurting. They’re dealing with their own pain and they take it out on others through displaced aggression. Understanding this can help me be compassionate to others, so I can be there for the people who are hurting as my loved ones have been there for me. Remember that life is not one journey, but many journeys. Previously, I saw my life as one big journey with a beginning (birth), middle (mid-life), and end (death). But then I changed my thinking to see my life as many little journeys. By doing this and allowing this one period of time to be just one journey that had a conclusion, I was able to let it go and put it behind me. I found as I wrote out each of my mini-journeys that I had so many good ones, but each had an ending. It’s like the saying “this too shall pass.” You’ll note that it neither says that what will pass is good or bad, just that it will pass. So this was the beginning of my hunt for me again. With the above in mind, I was able to take the next steps in recovery, to truly work toward self-acceptance. I know many people that don’t confront their past and continue to try to go around or over their problems. They cannot, and they end up frustrated with the world and those around them. But it doesn’t have to be this way. I go to bed now thankful for the day I had and wake up thankful for the day ahead. Each day I go on a bear hunt and each daily challenge I deal with, I go through it, grateful for the opportunity to try another day. Alan Eisenberg is an author, blogger and founder of Bullying Recovery, LLC, whose mission it is to help those suffering from the long-term effects of bullying to find the help they need by providing media, materials and support to seek and receive the help needed. His memoir, “A Ladder In The Dark”, is now available in print and eBook.